Property Size 1,220 sq. ft.
pullout sleeper sofa in the family room. 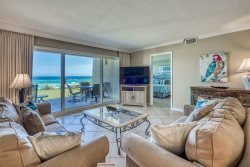 Tops'l Tides 301 is the perfect family getaway: a newly upgraded luxurious condominium now ranking as one of the most upscale in the building, located right on the Gulf in the most beautiful resort in the area!